Vol 4 | Issue 2 | May-Aug 2018 | page: 33-34 | Madan Narayanan, Sioned Phillips. 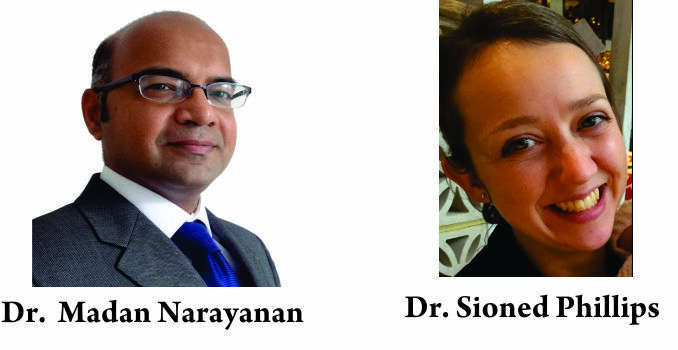 Authors: Madan Narayanan , Sioned Phillips . At our hospital, we have a growing regional anaesthesia service providing over 400 peripheral nerve or fascial plane catheters so far in 2017. We have recently had 2 episodes where rectus sheath catheters, which are our first line pain management for midline laparotomies, have become knotted whilst in situ and therefore been difficult to remove. One catheter required a small surgical incision (on the ward under local anaesthetic) to remove it, whilst the other was removed using artery forceps. Both were found to be knotted after removal from the patient (see picture). On both occasions the insertion of the catheter had not been documented. At out institution, most rectus sheath catheters are inserted by an anaesthetist using ultrasound, however some are placed at the end of the operation, by the surgeon under direct vision. It is well known that perineural and fascial plane catheters may kink and knot, however this is a rare phenomenon with an incidence of 0.13% . Our recent problems have caused us to re-think our practice and highlight some key issues. Documentation of any procedure is essential. When the same procedure maybe carried out by 2 specialities documentation is potentially even more important. The surgeons at our institution often suture the rectus sheath catheters after insertion, whereas anaesthetists do not. This information is key when attempting to remove the catheter. We have changed our practice, so that any rectus sheath catheter (inserted by either surgeon or anaesthetist) will now be documented by the anaesthetist within the notes (although, obviously, it would be expected that the surgeons do document any procedure they perform). The decision for this was prompted by the fact that anaesthetists are the first port of call when a rectus sheath catheter is difficult to remove, and we needed a mechanism to improve access to information as to how the catheter had been secured. We routinely leave rectus sheath catheters in for 3-5 days. After this amount of time, we would expect that they may be easily removed with minimal resistance. If there is any difficulty in removing the catheter first line management should be to flush the catheter with 10 mls of 0.9% saline, to make space around the catheter and dislodge any fibrous tissue attached to the catheter. This may fail if the catheter is knotted as the catheter is often occluded. We would then advocate using artery forceps to grasp the most proximal exposed part of the catheter, allowing increased tension and better manipulation of the angle at which force is applied to the catheter. If this fails surgical exploration may be required, depending on how much catheter is left in the patient, this may be done in a ward based setting as opposed to a return to theatre. Fluoroscopy guided catheter removal has also been described . We have now changed our practice with regards to how much catheter is left in situ. The optimal length of rectus sheath catheter insertion (or any fascial plane catheter) is unknown. Case reports of knotted perineural catheters imply that if more than 10cm of catheter is inserted it will increase the likelihood of kinking [2,3,4]. Our practice was to insert as much as possible, up to 15cm, however on reflection this probably increased the chance of knotting of the catheter. Our catheters have multiple orifices at the distal 3cm, and we now routinely only leave 5cm in situ; allowing adequate catheter for infusion of local anaesthetic, without excess catheters to kink and knot. Exact mechanisms that cause catheters to kink is unknown, but the most likely risk factor is a long length of catheter inserted either around the nerve or within a fascial plane. Our current catheters, PlexoLong 20g (Pajunk , Germany), are notably stiffer than others we have used, such as the Portex 20g Nylon epidural catheters (Smiths Medical, USA). This may also lead to an increased risk of knotting as they are more likely to kink when pushed up against resistance, such as a fascial plane. Kinked and knotted catheters are rare complications. With the increasing applications of continuous peripheral nerve and fascial plane catheters this is an important issue and knowledge of management of a difficult to retrieve catheter is essential. Burgher AH, Hebl JR. Minimally invasive retrieval of knotted non-stimulating peripheral nerve catheters. Regional Anesthesia and Pain Medicine. 2007; 3: 162-6. Rudd K, Hall J. Knotted femoral nerve catheter. Anaesthesia and Intensive Care. 2004; 32(2): 282–283. Kendall MC, Nafer A, Maniker RB, McCarthy RJ. Removal of a knotted stimulating femoral nerve catheter using a saline bolus injection. Local Regional Anesthesia. 2010; 3: 31-34. Motamed C, Bouaziz H, Mercier FJ, Benhamou D. Knotting of a femoral catheter: letter to the editor. Regional Anesthesia. 1997; 22(5): 486–487. How to Cite this Article: Narayanan M, Phillips S. Perineural and fascial plane catheters- how to iron out the kinks. Journal of Anaesthesia and Critical Care Case Reports May-Aug 2018; 4(2):33-34.